Unless you’re a native of Latin America, you may have never heard of the fruit cocona. So what is cocona, how do you eat it, and where is it grown? Related closely to the naranjilla, coconas are actually berries but are the size of an avocado and have a similar flavor to tomatoes. So coconas are basically large berries that taste like tomatoes…pretty neat, right?! Today we’ll show you how to grow cocona in your own garden and reap the benefits of the delicious and nutritious fruit! 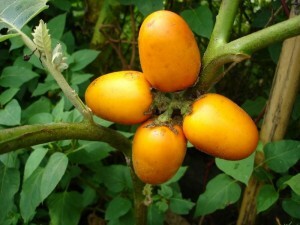 Cocona is also known as peach tomato, Orinoko apple, or turkey berry and its color varies from yellow to red, just like a tomato. The fruit grows onto a shrub that is about 6 feet in height, but there are many different varieties. Cocona fruits should be grown in tropical or subtropical climates, but you CAN try growing it indoors until summer provided it gets enough sun. The fruit can be grown either by seeds or propagated by cuttings. Choose soil with good drainage as the cocona plant does not like to sit in water. Plant the seeds about 3/8 of an inch deep in rows that are 8 inches apart. If growing in containers, plant about 4-5 seeds to get about 2 strong seedlings. Germination will occur anywhere from 15 to 40 days. Fertilize the cocona plant 6 times during the course of a year with a 10-8-10 NPK, with each plant getting about 2.5 ounces. Cocona plant will begin to fruit 6-7 months after planting. You should expect 22-40 pounds of fruit per plant. So now that you know how to grow cocona, what it is, and how to eat it, it’s time to roll up your sleeves and get to planting! How to Grow Cocona Fruits was last modified: October 3rd, 2017 by Aniela M.